It takes a unique and maybe slightly crazy person to look at what is essentially a pile of decaying, shrink-wrapped lumber on eBay and see the potential for a fully restored offshore fishing boat. For the challenge of saving two dumpster-bound stacks you’d need a dynamic duo afflicted with the precise mix of dedication and, well, cheerful craziness. Luckily for a couple of long-neglected Rybovich sportfish yachts, Reid Bandy and Mark Hall are the two individuals who have the right stuff. In taking on the ownership and salvation of a pair of 60-year-old boats, the two have invested nights, weekends and much of any leftover spare time orchestrating a complete side-by-side rebuild of the tortured old hulls using a blend of new and old boatbuilding techniques and materials. 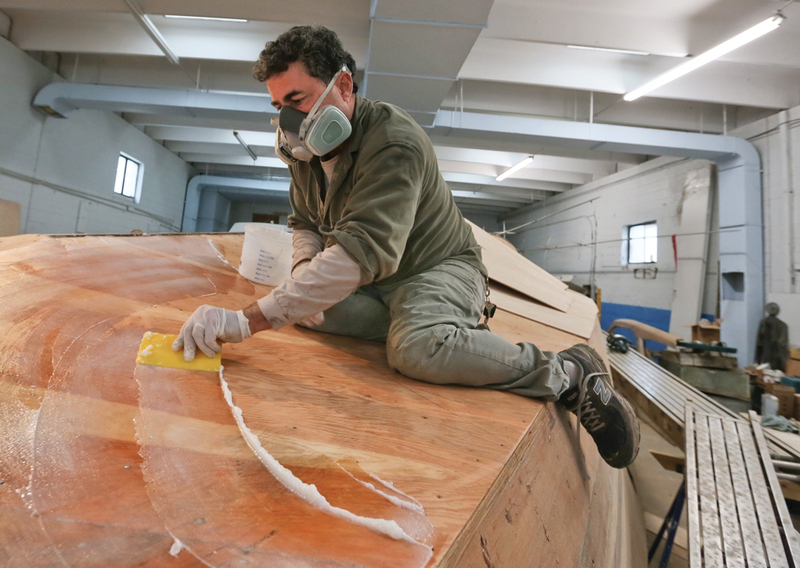 It’s happening in a small boat shop at Casa Rio Marina in Mayo, Md., where the boats have been transformed from the stuff of nightmares into stunning displays of persistent craftsmanship. The projects fulfill the lifelong dreams they share of owning Rybovich boats, perhaps the most storied and legendary name in sportfishing yachts. 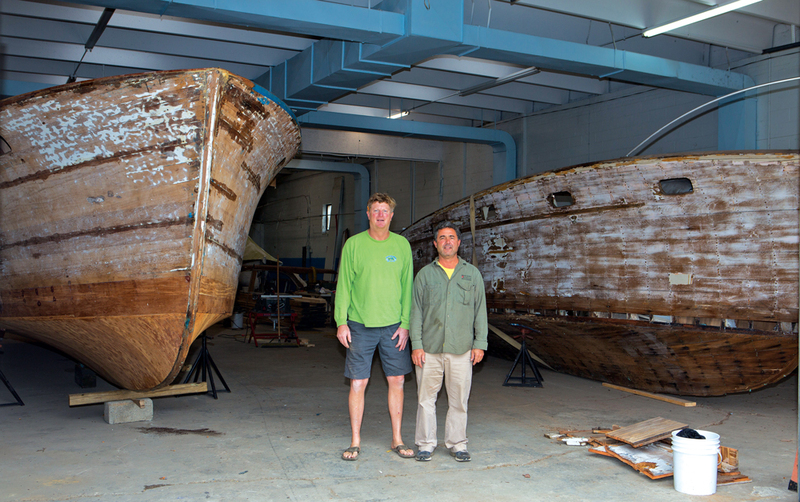 Despite Bandy and Hall respectively managing day jobs running auto restoration and home contracting businesses, the two craftsmen have deep roots in boats and boatbuilding. 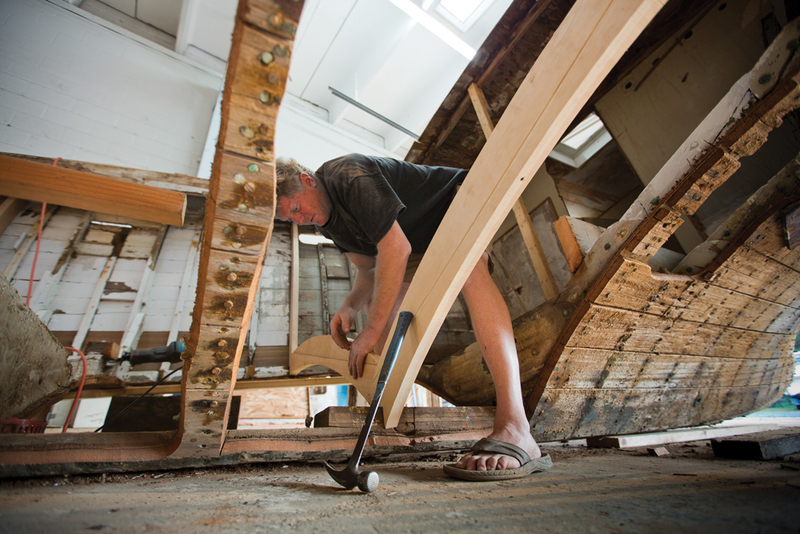 Hall attended boatbuilding school in Maine in the ’70s and spent time in the United Kingdom for a boatbuilding apprenticeship before returning home to Annapolis. He worked at Topaz Boats in Southern Maryland for a while but ultimately found himself tinkering with houses more than boats. He’s been in the home business for 30 years, specializing in historic restoration and general contracting. Bandy sailed one-designs with his father as a kid in Chesapeake Bay Yacht Racing Association-sanctioned regattas but eventually started messing around in fishing boats around the time he was a teenager painting cars in his driveway for extra money. “I never was an out-of-the-box boat kind of guy,” Bandy says. “I much preferred buying junkers and fixing them up the way I wanted.” By the time his Elite Auto Body business was successful Bandy was thinking about designing and building his own boats. Today, as if the Rybovich project weren’t enough, Bandy is building his seventh custom boat, a 24-foot ultralight carbon fiber center-console conceived to run 50 knots with a 90-horsepower two-stroke Yamaha outboard. The Rybovich end of this story begins one evening almost two years ago when Bandy was recovering from surgery. “I had messed up my shoulders pretty bad and had to have surgery, so I didn’t have many better things to do than sit on the couch,” Bandy says. “I ended up spending a lot of time on eBay looking for car parts for my auto restoration projects. Eventually I ended up wandering across an old 36-foot Rybovich hull. Then I found another 36-footer a little farther down the page. That’s rare.” Bandy initially ignored the two finds. “I didn’t pay them much attention; they were in pretty rough shape,” he says. Bingham had a figure of $10,000 in mind for both of the boats. Bandy and Hall countered with $5,000. By the time all the haggling was over Bingham settled for $9,000 for the pair. “Despite how fast everything went it wasn’t an easy decision,” Bandy says. “We had to ask ourselves whether these boats were worthy of our money, worthy of the time and expense of fixing them up, and if they would be boats we’d be proud of when we were done. Mark’s boat was in better shape, so he took that one, and I took what I called the ball of puss. 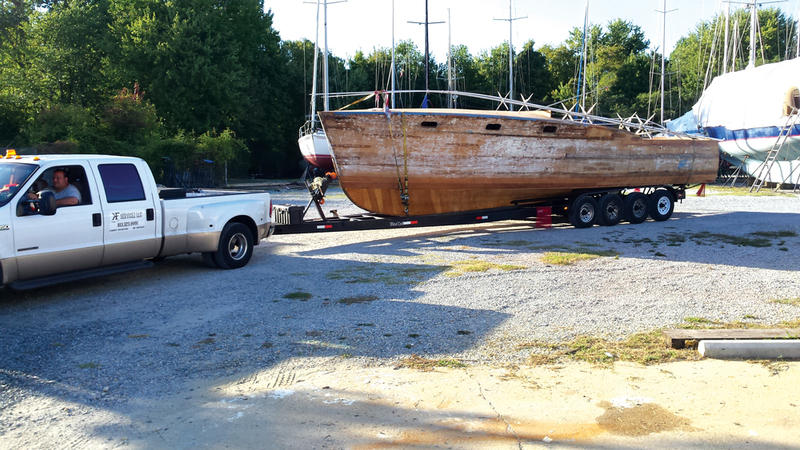 Mark had boatbuilding experience but I knew I’d ultimately feel better about having the more challenging boat.” Within a couple of weeks, the two hulls were northbound on Interstate 95, strapped to two flatbed trucks. Hall’s boat, Butterball, is hull number 12, built in 1954 as a surprise gift for Frank Lasier from his wife. The name affectionately refers to Lasier’s wife, who was apparently, ahem, big-boned, according Rybovich lore. Hall’s boat arrived at Casa Rio Marina in rough shape but better than Bandy’s Timid Tuna, which was not much more than a skeleton. Bandy and Hall knew that they’d be using a variety of techniques to rebuild the hulls and that each boat would require its own battle plan. For Bandy that meant a Sawzall reciprocating saw would become his new best friend. “I started by cutting out and removing frames. I used the old frames to cut a template for new ones out of construction lumber,” Bandy says. “But I eventually realized that I should just cut the new frames right off the pattern for the old ones as I removed them, so I began cutting new frames right out of clear Douglas fir. When I was done maybe two or three original frames remained.” Once he stabilized Timid Tuna’s framework he and Hall set about flipping the two boats over and rebuilding the hulls. Bandy and Hall then sanded out the new frames and the interior hull sides and sealed them with coats of Marpro laminating epoxy resin. They built mockups of the old cabin houses and put them into a CAD program to guide them in building jigs for the composite structure, essentially male molds of the cabin houses. The Corecell was then bent and fastened to the jig stations, glued at the seams with Gorilla Glue, then sheathed in fiberglass and epoxy. Last, the jig was removed and the backside of the Corecell sheathed in fiberglass and epoxy. “That cabinhouse weighs about half of what a wood house would weigh, and it’s stronger than frames and plywood would ever be,” Bandy says. Bandy’s interior is sticking with Corecell and fiberglass construction for the cabinhouse, decks, cockpit and interior soles, bulkheads, interior furniture and other interior fixtures, producing modern-looking curves and radiuses, resulting in a modern look. Bandy also raised the cabin height by seven inches to suit his six-foot, seven-inch frame. A look inside Hall’s boat reveals a higher utilization of wood. “I’m a wood guy,” Hall says, “I wanted a warm feel below, so a lot of the bulkheads and other interior aspects I did in wood. Maybe it means my boat ends up being a thousand pounds or so heavier than Reid’s boat, but I can live with that. The cabinhouse and a number of deck elements utilize Corcell just like Reid’s boat, though.” Hall has created a beautiful wraparound wood bulkhead in his boat’s forward cabin, as well as a gorgeous teak-trimmed offset berth in the bow. Hall and Bandy expect it be another year before they will splash their boats. “I’m hoping for next spring,” Hall says. “Me, too,” replies Bandy. The two plan to keep the boats on the Bay for a year or two before they take them offshore to pursue billfish and tuna. So, if you happen to find yourself driving past Casa Rio Marina in the evening and you see the midnight oil burning, chances are that Hall and Bandy are inside hard at work on bringing Timid Tuna and Butterball back to life.